Classically light and airy, with crispy outsides and moist and chewy insides, this quick-bread gluten free popover recipe brings classic holiday flavor to the GF table. MAKES 9 LARGE POPOVERS Serve these puffy delights fresh from the oven with butter and preserves or alongside holiday roasts to sop up sauces. Though best the day they’re made, they can be prepared a day ahead, kept covered in the fridge, and crisped in a 350°F oven for 5 minutes or a microwave for 1 minute just before serving. Popovers should not be baked close together because they expand quite a bit in the oven. Here, we distribute the batter between two muffin tins. You can also use nine well-greased 3/4-cup ceramic custard cups placed 4 inches apart on a rimmed baking sheet and baked 5 to 8 minutes longer than the directions below. Position a rack on the second lowest rung of the oven and preheat to 425°F. Thoroughly butter 9 of the outer cups of 2 muffin tins (5 in one tin; 4 in the other). In a blender, blend all of the ingredients until smooth, stopping to scrape down the sides with a rubber spatula and mix in any clumps of flour. Pour 1/4 cup of batter into each of the 9 greased muffin cups, dividing any leftover batter evenly among the cups, then bake, without opening the oven door, for 25 minutes. 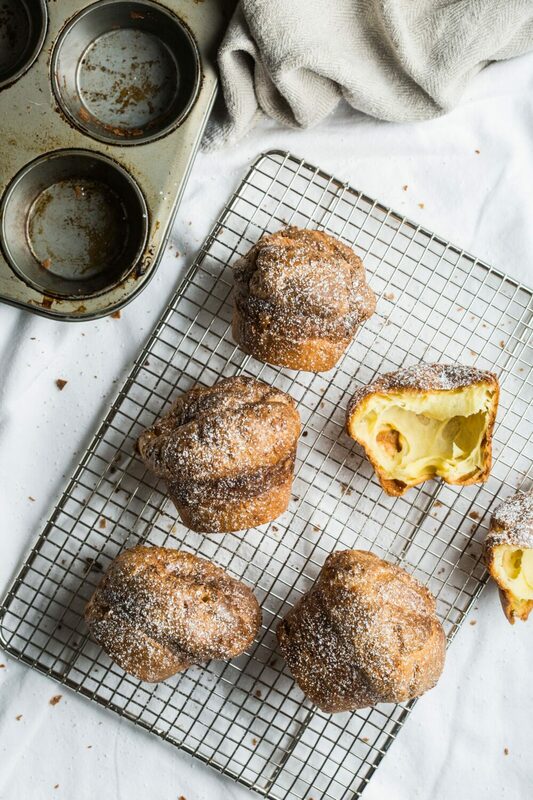 Reduce the temperature to 350°F (the popovers will already look golden brown) and bake a few minutes longer for a moister popover or 10 to 12 minutes longer, until crispy and deep brown, for a drier popover. Serve immediately.